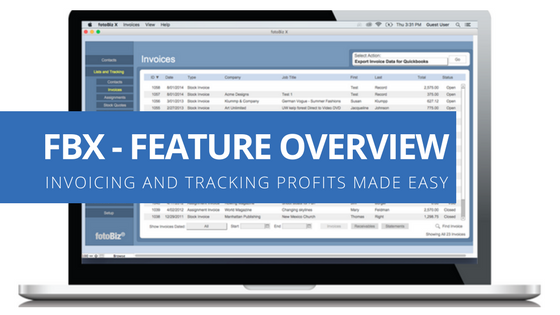 Our photography billing software, fotoBiz®, makes invoicing and tracking profits easy. Create stock and assignment invoices for the photography, illustration or video work that you do. Use the menu items as a workflow guide to make sure nothing is left out when creating an invoice. FotoBiz will help generate usage licenses for you with the RightsWriter™ License Builder. The license for each image can easily be copied and used for other purposes such as embedding the information into the metadata for the images you are delivering. This way you are assured that in addition to the licensing information on the invoice, that same information is included with the image. FotoBiz runs different reports based on your invoices that will help you understand where you profit. Run reports to see what images are selling and in what categories. Send monthly statements to your clients and quickly check your receivables. There is also a sales tax report you can create for any specified time period and the ability to export data for Quickbooks. In addition to conducting detailed searches, the main screen for Invoices includes a number of quick sorts. Each header row can be sorted ascending or descending. Sorting by Status for example will quickly group your Open and Closed invoices. There are also a number of date sorts you can conduct such as This Month, Last Month, by Quarter or by a custom date range. The following are some examples of the various types of reports you can run in fotoBiz X. You can also print Statements for your clients with the ability to customize your past due messaging. Anytime you create a license that has an end date, fotoBiz will keep a record of it for you. 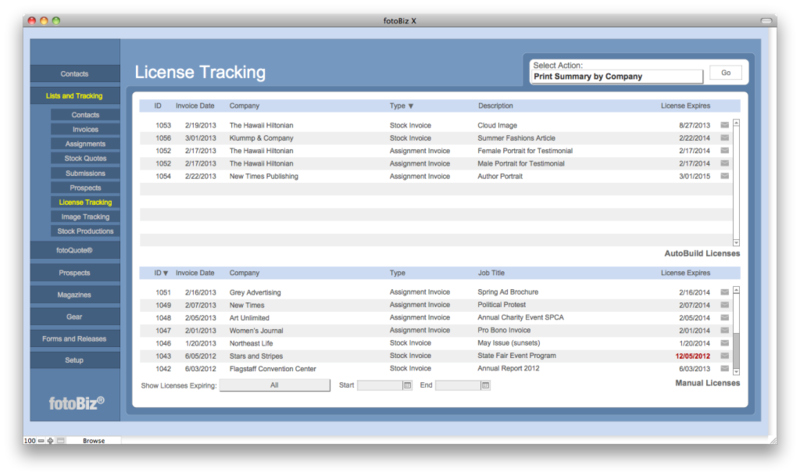 With License Tracking youʼll be able to easily see at a glance what licenses are coming due for renewal. Licenses in bold are coming due in thirty days and those in red have already expired. The letter icon to the right of each license will create a license renewal email for you automatically. 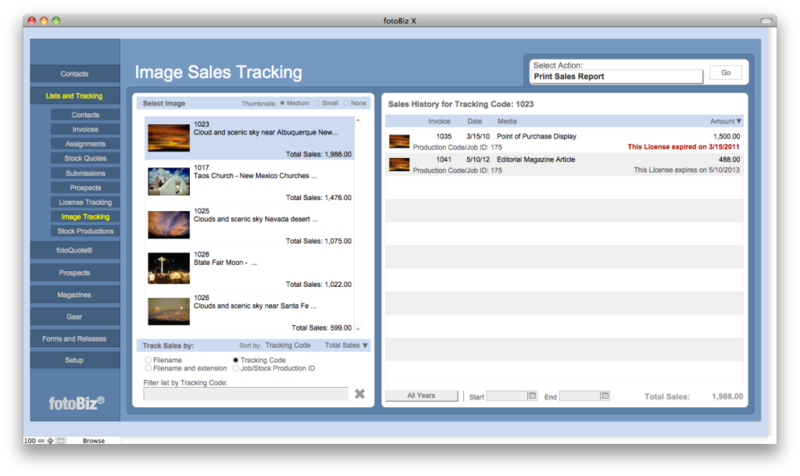 When you license images on stock invoices, fotoBiz tracks the sales for that image. This gives you meaningful data that tells you what types of images are making you money. You can also assign the image to a stock production and fotoBiz will track the sales of all images from that shoot. With the Total Sales sort option you’ll quickly see which images are your top sellers, how many times the image has been licensed, to whom and for how much. The ability to track sales from the stock images you license reveals the truth of what you do, where you are profitable and what kinds of images are selling. This is powerful information for anyone dealing with images in a volatile and ever-changing industry.